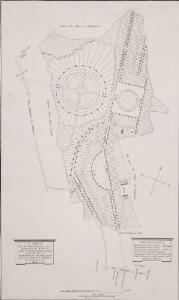 Description: The title of this plan of proposed residential developments at St. John's Wood, appears in a tablet at bottom left. A key to the dimensions of lots appears in a tablet at bottom right, with scale noted at the foot of the plate. The revolutionary layout of the estate included a grand circus (never built) surrounded by semi-detatched properties.